In 2013 a research group led by Katherine Flegal, epidemiologist for the United States Center for Disease Control, published a review of 97 individual studies that compared body mass index (BMI) to risk of mortality (Flegal, Kit, & Orpana, 2015). Combined, the studies reported on over 270 000 deaths from 2.88 million individuals living in the United States, Canada, Europe, Australia, China, Taiwan, Japan, Brazil, Israel, India, and Mexico. What the Flegal group found, paradoxically, was that compared to normal weight (BMI 18.5 to 24.9) having a BMI in the overweight category (BMI 25.0 to 29.9) decreased the risk of mortality. The findings received a lot of media attention and criticism (Hughes, 2013; Wilkinson, 2013). One noteworthy critic was Walter Willett MD, chair of nutrition at the Harvard School of Public Health. Willett was so incensed by Flegal’s findings that he dismissed the study as ‘rubbish’ on public radio (Aubrey, 2013). Willett also invited colleagues to a discussion panel at the Harvard School of Public Health to review the overall evidence on body weight and evaluate Flegal’s findings where he was further quoted as saying “If you don’t have the right goal you are very unlikely to end up in the right place.” (Harvard School of Public Health, 2013). Fast-forward to 2017 and Willet is listed as one of several researchers in a group led by Edward Yu that recently published its own analysis of BMI and the risk of mortality to challenge Flegal’s results (Yu et al., 2017). The Yu research group combined the data collected from three large surveys of health professionals living in the United States with 16 years of follow-up. In total, the Yu group’s analysis included 32 571 deaths from 225 072 participants. In contrast to Flegal’s study the Yu study used the maximum BMI recorded by participants over the 16-year follow-up period. The hypothesis in Yu et al was that by using maximum BMI instead of baseline BMI the effect of unintentional weight loss due to illness would be accounted for. The findings, presumably to the relief of the Yu team, did show that compared to normal weight having ever been overweight increased risk of all-cause mortality among those surveyed. The Yu group concluded that the paradoxical relationship found in Flegal et al, was reversed by using an extended weight history. 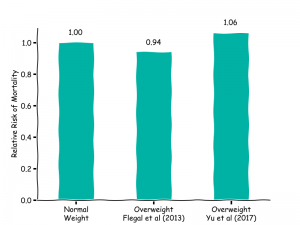 The difference in the relative risk of overweight between Flegal et al and Yu et al is shown in Figure 1. Figure 1. Comparison of the relative risk of mortality for overweight from the Flegal et al and Yu et al. So, do the conclusions from Yu et al replace the conclusions of Flegal et al? Probably not as the two studies are not directly comparable. The Yu study is less generalizable than Flegal due to a lack of diversity in ethnicity, geographical origin and socio-economic status of participants. In addition, the Yu group makes the assumption that the paradoxical relationship between overweight and mortality can be solely attributable to unintentional weight loss due to illness while the effects of intentional weight were dismissed as short-term. However, other studies have reported weight cycling in 20-35% of participants (Fildes et al., 2015; Rzehak et al., 2007) and weight cycling has been associated with increased risk of mortality (Dulloo & Montani, 2015; Rzehak et al., 2007). Using weight history would attribute any increased risk associated with weight cycling to the highest BMI reported and would be likely to inflate the risk of those who maintain a stable weight in each BMI category. It should also be noted that, Flegal’s results agree with other studies that found overweight to be protective in normal populations and obesity may be protective in chronic disease (McAuley & Blair, 2011). Furthermore, increased survival has been also observed in those with a BMI categorized as obese following cardiovascular surgery and stroke (Aparicio et al., 2017; Lv et al., 2017; Mariscalco et al., 2017). Finally, the contribution of Yu et al in demonstrating a reversal of the paradoxical relationship between overweight and mortality in a given population needs to be placed in context with other factors that define risk of mortality in people with a higher BMI. 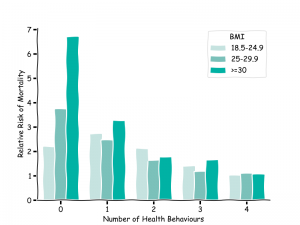 Below in figure 2 Matheson et al, used a survey of 11,761 men and women to show the difference in relative risk of mortality according to BMI and the number of maintained health-behaviours (Matheson, King, & Everett, 2012). Matheson et al and other studies like it have shown that the risk of death is better defined by health-behaviours (ie., fruits and vegetable intake, tobacco, exercise, alcohol) than by weight. Figure 2. Relative risk of mortality by BMI and number of health behaviours (ie, fruits and vegetable intake, tobacco, exercise, alcohol). In summary, Yu et al has shown that the paradoxical association between overweight and mortality may be reversed using weight history in some populations. However, in a study that aimed to demonstrate overweight increases the risk of mortality relative to normal weight the increase in risk of mortality was relatively small compared to other factors of health. What remains unresolved is the paradoxical relationship between aims of obesity research and factors that improve health outcomes. Flegal, K. M., Kit, B. K., & Orpana, H. (2015). Association of All-Cause Mortality, 309(1), 71–82. Hughes, B. Y. V. (2013). The big fat truth. Nature, 497, 8–10. There is an expectation in Australia that when we receive health care it stems from science-based medicine and evidence-based practice. To this end many health professionals use guidelines generated by the National Health and Medical Research Council (NHMRC) to inform their practice. The NHMRC describes itself as “Australia’s leading expert body promoting the development and maintenance of public and individual health standards”. One of the NHMRC’s numerous publications is The Clinical Guidelines for the Management of Overweight and Obesity in adults, adolescents and children in Australia (NHMRC, 2013). The 2013 publication provides general practitioners (GPs), practice nurses, Indigenous health workers and allied health-professionals with guidelines for best practice for the 63% of Australian with a BMI classed as overweight or obese (Australian Institute of Health and Welfare, 2016). In short, the guidelines recommend that primary health providers Ask those who live in larger bodies about their weight and Advise weight loss. This will not be news for many Australians who have received unsolicited weight loss advice from their primary healthcare provider, even when their weight bore no relevance to their presenting health condition. At this point if you are baffled as to how the clinical guidelines can both recommend weight loss and concede that long-term weight loss is unachievable, you are not alone. What makes the recommendations even more mystifying is that the pursuit of weight loss is not without risks. 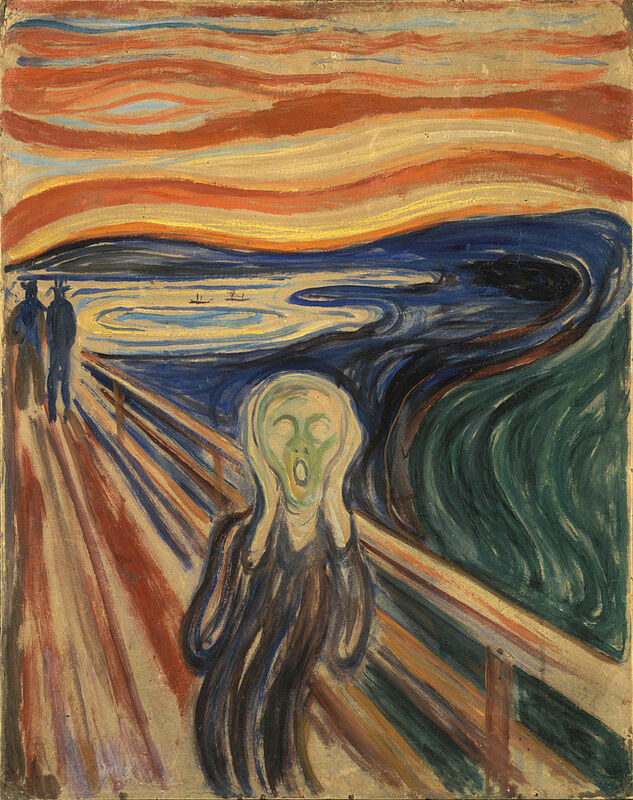 The potential harms of weight loss include disordered eating (Fairburn & Harrison, 2003), anxiety and depression (French & Jeffery, 1994), and weight gain above pre-intervention weight (Fildes et al., 2015). This may be a little confusing given the public health messages that weight loss is required to improve metabolic health if you have a BMI that is classed as overweight or obese. It is important to note that in the research studies demonstrating improved metabolic health the weight loss is moderate (2-5kg), and achieved through lifestyle interventions such as improved nutrition and increased physical activity. However, the studies attribute the positive outcomes to weight loss alone while the contribution of improved health behaviours are ignored. Ultimately, the recommendation for weight loss which will inevitably fail only serves to devalue the health-behaviours engaged to achieve it. Beneficial lifestyle interventions are also often overlooked for people in smaller bodies who are assumed to be metabolically healthy. The irony is that health-behaviours have the potential to significantly reduce the health risks associated with a higher BMI. Those who maintain a number of common health behaviours have been shown to have a similar low level of risk of all-cause mortality regardless of BMI (Matheson, King, & Everett, 2012). I make this point not to imply any moral obligation to pursue health but to highlight how weight-centric healthcare absolutely fails people in larger bodies. So, what are some sane recommendations for weight management? Firstly, provide all healthcare consumers with a more sophisticated assessment of their individual health risk than BMI. Next, abandon intentional weight loss to the ‘Wellness Gurus’, who are the true experts in cherry-picking the research and ignoring the evidence. Finally, both healthcare consumers and providers should replace the pursuit of weight loss with the pursuit of client-centred sustainable health-behaviours.